The modern atomic weight for the predicted element, or protactinium as it is now known, is close to 231. Even though this seems reasonably accurate, Mendeleev was somewhat unlucky regarding this atomic weight since he was not to know that protactinium is a member of only four 'pair reversals' in the entire periodic table. This situation occurs when two elements need to be reversed contrary to their atomic weights in order to order them. When atomic number was discovered it turned out to be a better ordering principle than atomic weight for the elements in the periodic table. All four known pair reversals, including the one concerning protactinium and thorium were suddenly resolved. Even though protactinium has a lower atomic weight than thorium it should be placed after thorium because of its greater atomic number. But it appears that Mendeleev's brief predictions were broadly fulfilled since the element does indeed show an analogy with tantalum in forming Pa2O5 as its highest and most stable oxide. Nevertheless protactinium also shows a strong horizontal analogy with thorium and uranium in also displaying the +4 oxidation state, something that Mendeleev does not seem to have anticipated. Finally, as Mendeleev also correctly predicted protactinium occurs with uranium, and more specifically in the ore called pitchblende. But whereas uranium and thorium were isolated in 1789 and 1828 respectively, it was not until the twentieth century before protactinium, was first discovered. Of course it depends on what one really means by the discovery of an element. Does it mean somebody realizing that a mineral contains a new element, or does it mean the first time an element is actually isolated? 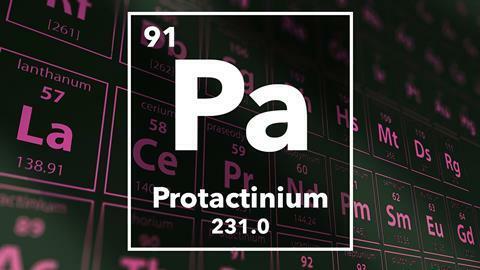 Depending on what choice is made the discovery of protactinium can be assigned to different scientists. And in the case of protactinium there is an even further complication. In the year 1900 the English scientist and inventor Sir William Crookes pointed out that a new radioactive substance was present in some ores of uranium and he called this substance uranium-X. Uranium-X turned out to be two different substances later called UX-1 and UX-2 of which the second, UX-2 was first isolated by the Polish chemist Kasimir Fajans in 1913. This was a very short-lived isotope of 234Pa with a half-life of just over one minute. Fajans called the new element brevium after its short half-life. In 1917 the German physicist Lise Meitner isolated a more stable isotope of the element, 231Pa with a vastly longer half-life of about 33,000 years. At this point Fajans withdrew the name brevium since the custom was to name an element according to longest-lived isotope. 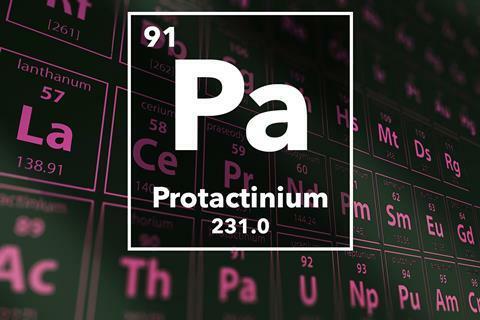 Meitner than chose the somewhat awkward sounding name of protoactinium which was eventually abbreviated to protactinium. The name she chose refers to the fact that this element is the progenitor of element 89 or actinium, which is formed when protactinium decays via the loss of an alpha particle. In the very same year, the same isotope, 231Pa, was independently isolated by Frederick Soddy, who had first coined the term isotope, and his colleague John Cranston when they were working together in Glasgow. Protactinium is a highly radioactive and highly toxic element with yet no commercial applications but nevertheless of some scientific interest. For example, a measurement of the ratio of 231Pa and 230Th in ocean sediments allows scientists to reconstruct the movements of bodies of North Atlanticwater that took place during the melting of the last ice-age. In 1961 the Atomic Energy Authority in Britain produced a concentrated mass of 125 grams of protactinium after processing 60 tons of radioactive waste. For many years this has remained as the only significant supply of protactinium which has provided samples of the element to labs around the world. So a highly radio active and toxic element whose origin and isolation had scientists mystified. That was Eric Scerri from the University of California, Los Angeles, with the perplexing tale of protactinium. Now next week an element that's definitely got one up on the rest when it comes to history. Perhaps iridium's best-known claim to fame is as a clue in a piece of a 65 million-year-old Crime Scene Investigation. The concentration of iridium in meteorites is considerably higher than in rocks on the Earth. One class of meteorite, called chondritic (meaning they have a granular structure) still has the original levels of iridium that were present when the solar system was formed. And join Brian Clegg to find out how Iridium can inform us about life on earth in next week's Chemistry in its Element. Until then I'm Meera Senthilingam and thank you for listening.